Synopsis: “There are no men in Claysoot. There are boys—but every one of them vanishes at midnight on his eighteenth birthday. The ground shakes, the wind howls, a blinding light descends…and he’s gone. In Claysoot, a town enclosed by a wall with black mist on the outside, boys disappear as the clock strikes midnight on their 18th birthday. This is known as being ‘Heisted’. On the day after his older brother is Heisted, Gray discovers a peculiar secret that sets the story rolling. Taken was overall a very enjoyable read. I found the dystopian town very engrossing from the beginning, although many questions do arise from it. Things like how they keep time, how they managed to learn to read and write without many materials and so forth. I did manage to push these thoughts aside though as Gray’s story was very engaging. From the start, the reader is thrust into the mind of this character who’s rash and stubborn. We’re shown someone that hits girls when he loses his temper, slams doors and is overall a little selfish. That, we learn, is the main protagonist. While he’s not entirely loveable, his natural instinct to follow his gut does highlight his character and helps him during his journey. Gray’s adventure is very fast paced as he learns new information in each place he ends up. He and his ‘girlfriend’ Emma, escapes Claysoot and is brought to Taem, a domed city run by a man named Frank who explains his cities (AmEast) is continuously being attacked by AmWest who’ve lost once during the civil war between them two. Gray ends up in Taem for a little while, meeting Frank and being mesmerised by his fatherly gestures. /SPOILER/ What I really didn’t like about Frank was how bad of a villain he turns out to be. And by bad, I mean he just didn’t seem as evil as people make him out to be. I think Bowman tried to show his evil ways through rash death penalties and his organised armies … but for me, it just doesn’t work right. I don’t hate him as I should, and while I don’t support him, I just really didn’t care whether he won or lost his battles. /SPOILER/ I really would have rather learned more about the beginnings of the civil war between AmEast and AmWest … what brought it about and how the hell did Frank manage to dome a whole city? What I did care about a little was the love triangle. Ha, yes, there was a love triangle and I managed to care a little. This might be because it was written much better than the supposed one with a male protagonist in The Maze Runner by James Dashner. And speaking of which, much of this story is quite reminiscent of The Maze Runner. But I thought it was executed much better. While TMR was just full of weird scenarios and questions upon questions, Taken actually answers some of these questions. I’m so happy Bowman didn’t find the need to keep questions unanswered until the second installment. Gray has liked Emma, a clinic worker’s daughter, all his life. While he manages to escape from Taem, Emma gets left behind within the city as he heads for the mountains where the Rebels of Frank’s Franconian Order is supposedly hiding. There, he meets Bree, a strong-willed girl – a complete opposite of Emma. While reading from a male’s perspective is a little different to the vast majority of female-led dystopians on the market, the two love interests pretty much take on the same feel. They’re obviously opposites of each other – I mean, how else will Gray otherwise fall for two people. I think the triangle played out well here because it manages to build Gray’s character. Rather than it being the centre of the story, it sits to the side but helps Gray realise how selfish he is worrying about it when there are people dying everyday due to the war. While it’s nice to read about some romance, it was much better to learn that this love triangle plays a bigger part than for no reason but to hook readers. 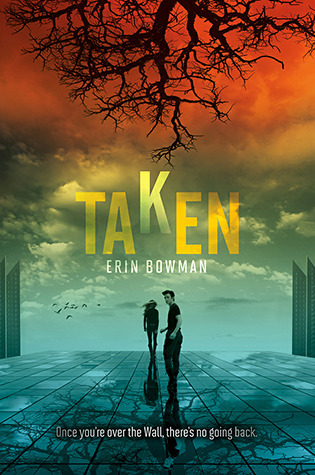 Taken was a very enjoyable read and I’m highly anticipating the second book. I hope Bowman manages to fill in some inconsistent holes scattered throughout the story, but other than that, a wonderful debut novel! THANK YOU: HarperTeen on Edelweiss for providing me an electronic ARC for an honest review.